While spring is now in full swing in Chicago, the first real break in the winter weather came several weeks ago. It was a stunningly beautiful day with seventy-degree weather and an almost impossibly blue sky, which was particularly refreshing after the hellish winter we had up here. As I was still pretty new and hadn't been able to explore much since I moved here during one of the longest streaks of sub-freezing temperatures (I don't have an exact number, but it was in the neighborhood of 20 days). That break in the weather provided me with one of my first opportunities to get out and really explore my corner of the city. Wandering around and exploring new places is, easily, one of my absolute favorite things to do. I live not far from Graceland Cemetary, which is to Chicago what Greenwood is to Brooklyn, or Pére Lachaise to Paris. Part of my microadventure involved hunting through this veritable city of masoleums and obelisks for the graves of architectural heroes like Louis Sullivan, Mies Van Der Rohe, and Daniel Burnham. While all three graves are beautifully marked, I had a sort of "moment," I guess you'd say, when I was standing at Burnham's grave. In a city like Chicago, a place built on sheer hubris and ambition, it is hard not to feel like making the trip to Burnham's little island on the northern end of Graceland lagoon is like making some sort of pilgrimage. As I stood there, taking in the importance of the man who lay under my very feet, the wind picked up, and an L train (the red line runs along the eastern edge of the cemetary) rumbled past. I realized, in that moment, how very distinctly "Chicagoan" that place was. It was part geography, part atmosphere, part timing. I was in the Windy City, at the grave of one of its greatest builders, listening to a train rumble down the city's fabled elevated transit tracks. It was a small moment, but it really made me appreciate the uniqueness of the city I had chosen as my new home. One of the blogs I follow, over at PerfectCity.net, has a thing going on where readers can fill out questionnaires about the challenges facing the contemporary metropolis. I filled one out and they put it up. So to anyone who followed the link to this blog, Welcome to Where. The embarassing mega-antennea is gone. Thank God. Blair Kamin, architecture critic for the Chicago Tribune, has a new article on the re-designed supertall skyscraper proposed for the city's downtown waterfront. Kamin's assesment of the building is mixed: while he praises the its inspiring silhouette for breaking "the flat-topped precedent of Sears Tower and Chicago's other 20th Century giants," he argues that the Spire still has a ways to go. I have to agree, though I doubt that it will ever become what it should be. As Kamin's multimedia presentation (which accompanies the article) notes, Calatrava stated in a recent presentation that the form of the Chicago Spire is based on a snail's shell. What, exactly, does this have to do with downtown Chicago? You'd be hard-pressed to find a person who'd deny the abundance of potential contextual cues that could be taken from a site like the one that the Spire is proposed for. Chicago has a legendary architectural tradition...and perhaps this is why the (I'll admit, much improved) re-design of the Spire still doesn't feel right: there's no Chicago in it. My main complaint about most of Calatrava's recent buildings is that, while many are fascinating in terms of their innovative engineering and daring form, they almost never feel like they belong where they are proposed. The starchitect's designs (like those of most contemporary starchitects) feel as if they started as ideas in their creators' heads, and were then superimposed onto a site to which they were not at all connected, purely for the purpose of making a bold personal -- not architectural -- statement. The Spire feels like a very tall, very shiny emblem for the greatness of Santiago Calatrava, not of Chicago. And seeing as how Chicago is the birthplace of the skyscraper, this seems especially inappropriate. EDIT (3/28/2007 - 6:22 PM): I forgot to mention -- I do love the amount of public discussion that this project is generating. Whenever the public gets interested in architecture, someone's doing something right. It's just not always the architect of the subject matter. Pride in Place: Habitat Homeownership in L.A.
Our families are all required to invest 500 hours of sweat equity in helping to build their houses, and this requirement defines the success of Habitat for Humanity. Sweat equity is essentially volunteer labor. In my mind this is what makes Habitat for Humanity unique when compared to all other programs, because it engenders buy-in from the family. Typical homeowners move every seven years, but Habitat families stay in their homes much longer. In 16 years we have built almost 200 units, and only two families have ever moved out. They both got better jobs—one in Portland and one in Texas. Also, we have had zero families default on their mortgage in 16 years. Since they build their homes and neighborhoods, our families have such a sense of pride and ownership that they want to pass their houses on to future generations. I'm well aware that the importance of community investment is hardly an earth-shattering concept. But I think that it's impressive -- and inspiring -- to see numbers like these. 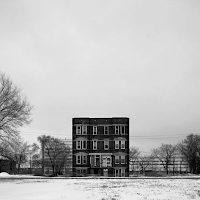 A photo essay by David Schalliol, currently featured on Gaper's Block, highlights the effects that sprawl at the edge of Chicago have had on some of the inner parts of the city. I am fascinated by photos like these -- images that highlight the destructive effects of suburbanization by focusing on the remains of once-vibrant urban neighborhoods. There is a painful irony in seeing urban buildings in seemingly suburban settings (the image above of the six-flat with its massive "yard" is the most blatant example.) While I fully support the idea that people should have the right to live wherever they want to, these images illustrate the stark and very real consequences of what happens when people do not invest themselves in their communities. When no credence is given to the built environment, a place becomes easily abandoned, because it is easy to desert a place to which you are not tied at the first hint of a problem. I recently read a post about gentrification on an architecture message board that pointed out the central problem with this phenomenon: people want to live in urban places and have the amenities that they offer without having an urban mindset. They want the easy access to retail and restaurants and museums without having to get involved in the community that they are moving to. This requires them to move to an area that is already squeaky clean and problem-free -- hence the line about artists being the stormtroopers of gentrification. The photos in Schalliol's collection, then, are frighteningly immedeate in that they show what could easily become of currently gentrified areas in the future if the tides of trend change. If you find this absurd, consider the fact that the South Side of Chicago and The Bronx in New York were once some of the wealthiest areas in their respective cities. Visualizing Density, the study mentioned in the previous post, lists common misconceptions about high density areas: crowding, monotony, a lack of privacy, and of green space. While the idea of people choosing suburban environments over urban ones because of fear of monotony seems a bit ridiculous (though I'm sure that it happens with mind-bending frequency) I can understand where people would worry about the loss of privacy and personal space, as these are very important in terms of having a place that is one's own. But I'm not sure why low-density communities look so much more attractive than misrepresented high-density areas, since they often just flip the coin and provide residents with too much private space -- isolation. I've never, ever understood the societal obsession with having a yard, which is sort of the cornerstone of the low-density suburban community. I grew up with a decently-sized yard (though we had plenty of private space in our house), and have a lot of great memories of getting together with all of the kids in my neighborhood and playing marathon games of "kick the can" or "ghost in the graveyard" that stretched long into the night. I have no fond memories of playing alone in the quiet privacy of my empty back yard. And, unfortunately, the memories of those marathon games are few because, since the neighborhood was so spread out, the opportunities for everyone to get together were infrequent. Even when they say that they don't, people like to be around people. They may not enjoy huge crowds (or even conversation -- cranky codgers! ), but there is a distinct sensation that accompanies walking down a busy street. Well-trafficked areas feel safer and livelier, and remind us of the fact that we are a part of a community. As Jane Jacobs famously highlighted in The Death and Life of Great American Cities, sidewalk life is what builds strong social neighborhoods (which are infinitely more important than lines on a map.) So the [mis]use of space seems to be one of the most critically misunderstood aspects of planning in the public realm. Low-density areas essentially take all of the space that would normally be used for socializing and privatizes it. And worst of all, this is seen as an upside. Play the density game, too. It's fun in a weird, old-skool SimCity way. Metropolis currently features an article on the impending demolition of Marcel Breuer's Ameritrust Tower in Cleveland. The article reads like a sort of half-hearted defense of the tower and Breuer's body of work, but the sentiment here seems to be pro-preservation, not so much pro-Breuer. It's sort of like the ACLU defending a KKK member's free speech for the sake of protecting free speech itself. It is a commonly-held belief, understandably so after the devastating social and artistic destruction wrought by the so-called Urban Renewal movement, that the destruction of a building purely on the basis of its being "ugly" or out of fashion is a very dangerous thing. I don't disagree. But I do wonder what can be said for Brutalism, a style of architecture frequently criticized for its indifference to context and its tendancy to be overly conceptual -- to the point of being dehumanizing -- in terms of its value in contemporary society. It seems futile to debate the merits of one architectural style over another, but there are functional components to style that do, I think, make buildings from some architectural movements of lesser worth to society based on the fact that they do not produce an environment that is conducive to human activity. Brutalism is a style of design that focused on materials and structural honesty (what Wikipedia cutely refers to as "the celebration of concrete.") It is part of a failed utopian vision centered on a kind of rigid equality. It is a style that, as a movement on the whole, failed to acknowledge the messy, blurry lines of human nature. It's no wonder that people can't relate to Brutalist buildings, then, because they are based on a stark idealism that most human beings either don't understand, or flat out reject. So what can be said for buildings that were designed without people -- the real, unidealized kind -- in mind. Are these buildings worth saving for some sort of artistic merit? Are they worth saving in order to make a point? And if the cost of preserving them is a less human environment, does what we gain by preserving Brutalist structures, in terms of ideals and ideas, offset that cost? Hello! Thanks for checking out my blog. I want to start off by introducing myself. I have been studying the urban form and the built environment for over a decade now. I first got interested in cities when my fascination with theme parks got me hooked on books about Las Vegas. These led to a more general interest in urbanity and, following a (presumably) logical progression, architecture. I started out my college education as an architecture major, but decided that it was not for me. I am less interested in the process of designing buildings than I am about the ideas behind them, and how they fit into the larger context of society and contemporary culture. Over the past year I have become very interested in the concept of "place," and how it is defined. With the Where blog, I'll be examining this concept from different perspectives, on different scales -- the macro and the micro. What makes New York feel so different from Chicago? How do we define "character" in relation to establishing a sense of place? How do people use place to define who they are, internally and externally? How do our physical senses enhance our perception of place? What role does architecture play in successful placemaking? And what, exactly, does it mean to "make" place? Thanks again for visiting this blog. Welcome to Where.